Learn the basics. No download required. Next Steps: Free FME Training! Everything starts in the FME Server web interface. Access it via the URL you configured during setup, or if you’re using FME Cloud, via the URL of your cloud instance. This tour demonstrates common automation scenarios, including running FME workspaces on demand, setting up schedules, and creating triggers. 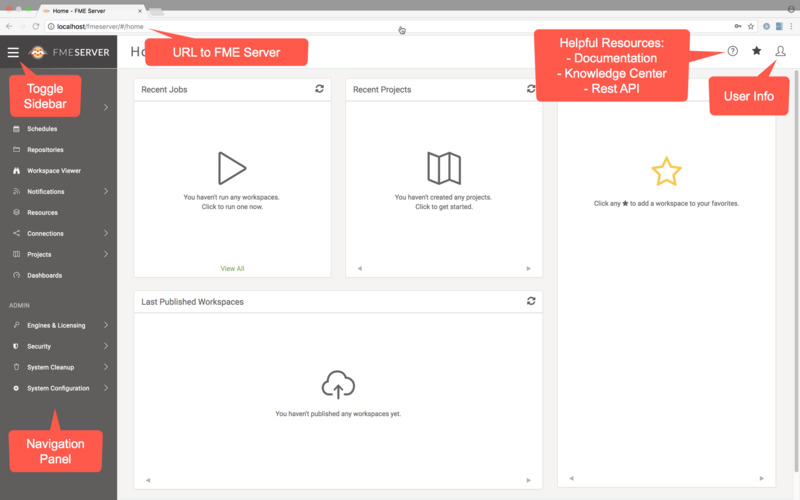 Tour the FME Server web interface in more detail on the FME Knowledge Center. The first step to automating an FME workspace is to publish it to FME Server. This tour assumes basic knowledge of FME Desktop, the authoring environment for workspaces. Start by opening your completed workspace in FME Workbench. In the top toolbar, click Publish to FME Server. Choose your FME Server Connection from the drop-down list (if this is your first time connecting to your FME Server instance, set up the connection by clicking Add Web Connection). Click Next. Select or create the repository you want to publish the workspace to. Click Next. Check the services you want to use. This depends on what you want to do with the workspace. Click Publish. You can now access your FME workspace in the FME Server web interface. Continue with the examples in the left sidebar to learn how to perform specific automation tasks. The FME Server REST API provides methods to control a range of FME Server functionality. This is a more advanced way to use FME Server. Explore live demos and get started with the FME Server REST API. In this exercise, we’ll publish a workspace to FME Server and run it from the FME Server web interface. Click Next to get started. Publish your workspace to FME Server using the steps outlined in the FME Server Basics section above. In the last dialog window, check the Job Submitter service. Go to your FME Server web interface. In the left navigation pane, click Run Workspace. Select the published workspace using the Repository and Workspace options. Under Service, click Job Submitter. Click Run. Click View Details to see the log file for the completed job. Well done. You published a data loading workspace to FME Server and ran it on demand. In this exercise, we’ll create a schedule to automatically run an FME workspace on a daily basis. Click Next to get started. Go to the FME Server web interface. On the left navigation pane, click Schedules. On the top right, click New. Give your schedule a Name, Category, and Description. Define how often you want the job to run. For this scenario, we will check Run Immediately and set it to repeat every 1 Days. Under the Workspace section, choose your repository and workspace. Click OK.
Well done. You created a schedule to automatically run your FME workspace once a day. Explore this example in more detail on the FME Knowledge Center. In this exercise, we’ll enable end users to extract data on demand. Click Next to get started. To create a data download service, start by building an FME workspace that converts to the desired data format, and expose the parameters you want the end user to be able to control. For this scenario, we’ll expose the Source and Destination File, File Format Extensions and Coordinate System parameters so the end user can control the translation. Publish the workspace to FME Server using the steps in section 1.2 above. Upload the Data Files. Check the Data Download service in the last dialog window. The following steps show how the end user can run the data download job. Go to your FME Server web interface. In the left navigation pane, click Run Workspace. Select the EasyTranslator workspace in the Samples Repository. Under Service, click Data Download. Choose the parameter values. Click Run. Your results will be available as a URL after the job finishes. Click the URL to download the data. Well done. You published a workspace to FME Server and enabled it for Data Download. Now any user can download this data through the FME Server web interface. In this exercise, we’ll create a directory watch notification to monitor a directory in the FME Server Resources for new files. Click Next to get started. In the FME Server web interface on the left navigation pane, click Notifications. In the Publications tab, click New. Give your publication a Name, set the Protocol to Directory Watch, and choose/create a Topic To Publish To. Configure the Protocol Settings with the directory you want to monitor, and the action(s) you want to get a notification for. Click OK.
On the Notifications page, go to the Topic Monitoring tab. Under Topics to Monitor, select the topic you created. Click the Play button to start monitoring. Test your workflow by adding a file to your monitored directory. A message will appear in the Topic Monitoring tab. Well done. You created a directory watch notification and configured it to monitor a folder. Now FME Server is ready to trigger an action whenever a file changes in the FME Server Resources. In this exercise, we’ll create set up FME Server to receive emails. Click Next to get started. Give your publication a Name, set the Protocol to Email (SMTP), and choose/create a Topic To Publish To. Configure the Protocol Settings with the Email User Name. Click OK.
Test your workflow by sending an email to your FME Server (if it is publicly accessible). The email address will be Email User Name@FME Server hostname. A message will appear in the Topic Monitoring tab. Well done. You created an incoming email notification. Now FME Server is ready to trigger an action whenever an email arrives. In this exercise, we’ll create a notification that runs the AustinApartments.fmw when a topic is triggered. On the Notifications page, go to the Subscriptions tab. Click New, then select Workspace as the protocol. Give your publication a Name and choose/create a Topic Subscribed To. Configure the Protocol Settings with your connection details, the directory you want to monitor, and the action(s) you want to get a notification for. Click OK.
Use either the Directory Watch or Receive an Email options to trigger a topic (ReceivedEmail or DirectoryWatch topics) that the workspace is subscribed to. View the Completed Jobs page to check that AustinApartments.fmw ran. Well done. You built an FME workspace that automatically runs a workspace when a topic is triggered. This can be the directory watch or incoming email (or any other publication). We want to help you learn FME, so all of the online training provided directly by Safe Software is free of charge. Watch videos as our FME Certified Trainers take you through our course exercises. Take our full FME Desktop course free of charge, complete with virtual machine and live Q&A. Access a range of getting started tutorials in our Knowledge Center.